Bring on the ukulele action! A few bits of news this week. Yesterday I had confirmation from the insurance company that my laptop has indeed gone for a Burton, taking a draft of my novel with it to its tea-sodden grave. Fortunately, I have managed to patch together the novel again from previous versions combined with some creative reconstruction work, and it is now complete – with a ninja space whale on the mantelpiece and everything. I am shortly going to start work on the proof-read version to correct those pesky typos, and then I think I’ll cut a couple of unnecessary scenes to make the middle section a bit pacier, and then I’m done. It will be time to cast the new version of The Heartland of the Winter upon the waters and hope it washes up at a good home. I also had some good news from one of the competitions I entered – I’ve won 3rd place! Not as good as 1st place, admittedly, but much better than two-tenths of bugger-all. Not sure how many entrants there were, I’m hoping more than 3. The result hasn’t been officially announced yet so I suppose I probably shouldn’t say any more for the moment, but rest assured, I’ll give a full report in good time. It’s now been over six months since I started my four-days-a-week ‘compressed hours’ work thing, and people are always asking me how it’s going. The short answer is, great. I mean, here I am, on a Friday morning, writing a blog post in my dressing gown. I’m not sure how long this arrangement can last, so I’m determined to make the most of it while I can. There’s a life lesson in there somewhere. So I am essentially working four days a week at my day job, and then two days at my writing. My productivity at the writing has gone up, whilst my productivity at the day job has held steady – a pretty good result. The only thing is, once you’ve factored in stuff like the yoga I need to do to stop my spine seizing up from all those hours spent hunched over a computer, there’s not much time left over. My cultural activities – outside of reading books in the bath – are strictly limited, not least because I never manage to get round to checking if there’s anything on which might be of interest. Which is why I love it when a friend invites me to come and see a banjo-based bluegrass band with some ukulele action on the side. 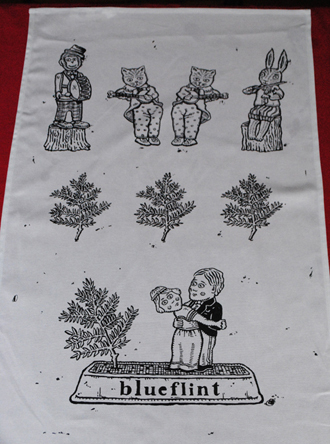 If it hadn’t been for her, I’d have never even heard of Blueflint, still less seen them play at Derby Assembly Rooms. They were fantastic – not just musically but as personalities – warm, witty, trying to persuade us to buy tea-towels in the interval. Some of their songs were funny and upbeat, others were dark and eerie. Personally I love the darker side of folk music – murders, jilted lovers, the stories of the oppressed and marginalised – and they certainly explored some of those themes. At the end of the gig they announced they were seeing us out into the rainy evening with a murder ballad. Then they came back on and did a song about revenge, singing ‘I’m the P in your P45, the dogshit on your shoe’ with glee. Brilliant. But my favourite was a spine-tingling song they did early on called ‘High Bright Morning’, which was sung from the point of view of a dead person, lamenting all the opportunities left untaken. There’s a life lesson in there somewhere.